Rugby Contact and Support Contact Skills Ball carrier goes into contact with the tackle pads. Break through and offload to a supporting player. Rugby Seal Contact Skills The aim of the drill is to develop good techniques to protect the ball and stay in a strong position. Rugby Single Tag rugby. Contact Skills Start the session with a game of single Tag rugby. Rugby Ankle Rotations Agility & Running Skills Simple ankle rotations in a clockwise direction. Reverse the direction to an anti-clockwise direction. Rugby Put in and strike Contact Skills Adding the 'put in' and 'strike' to the 3 person front row. Fun game 1 v 1 game to improve skills on both sides of the breakdown. The Moles want to turn the cones onto their head, and the Green-keepers want the cones the right way up. 3 vs 2 in a grid. Defenders must stay in position to start. Turnover wall, decision-making, contact skills and gameplay. The aim of the exercise is to develop ball control and reaction catching skills. Game for scrum halves to practice their box kicking skills. 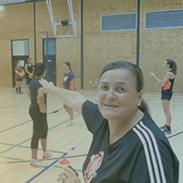 • The aim of the drill is to develop reaction catching skills. Drill to practice/teach evasion skills. Vital skills to beat a defender and get the football. Great the large numbers, variety of skills in small areas and can be advanced/simplified for all abilities. Groups of four, players stand in a T shape with about two yards between each player. These drills are perfect for players to work on there handling skills before a session starts. Grid: 10 x 20 or 30 (depending on age) with up to 4 balls, depending on age/ability of players. See the diagram for suggested starting positions. 10 moves forward with the ball, drawing the defence to press. Defender can choose any line as a start point. This game is designed to introduce passing at moving targets on the run. Have 8-10 players standing in a line with a scrum half at the end a few metres in front. The aim of the drill is to develop basic high ball catching skills. Drill to practice skills and creating space. The passer passes the first ball, from the ground, to the catcher, who sets the ball down. Passing and receiving exercise to warm the players up and get the handling skills ready for training. Tackle to start in a low position. Tackler to start in a low position. Develop speed to break down and attacking skills. 5 v 5 match, after each touch the touch player must simulate a ruck by hitting the floor. This game is to increace heart rate, reaction times and footwork. Develop the aggressive Blitz defending style in you game and don’t let the opposition get comfortable on the ball with this session. Get your players thinking their way through this session, focussing on Drift Defence when the opposition have an overlap on the outside. Developing decision making skills to improve support play! Make the right decision. Get players to offer support when it’s most needed and keep your attacks alive. How can I get players (U15s) to take the initiative). 1. Ruck Clean Out for Ball Retention:*3 Players to hit tackle shield. *Scrumhalf passes to 2nd pod, hit group 2 tackle shields. Forwards: Henning Joubert/Hannes DirsuweiBacks: Jaco Barnard-Running In Attack, Ball Carrier Support.